Harry Bertoia had a prolific and varied career ranging from furniture design to sculpture to graphic design. However different in form, with each medium Bertoia expressed his innovative and unique artistic sensibilities. His design for this Coffee and Tea Service captures the streamlining trends in 1930s and 1940s design—a time when everything from vacuum cleaners to car fenders were subject to a curvilinear aesthetic. 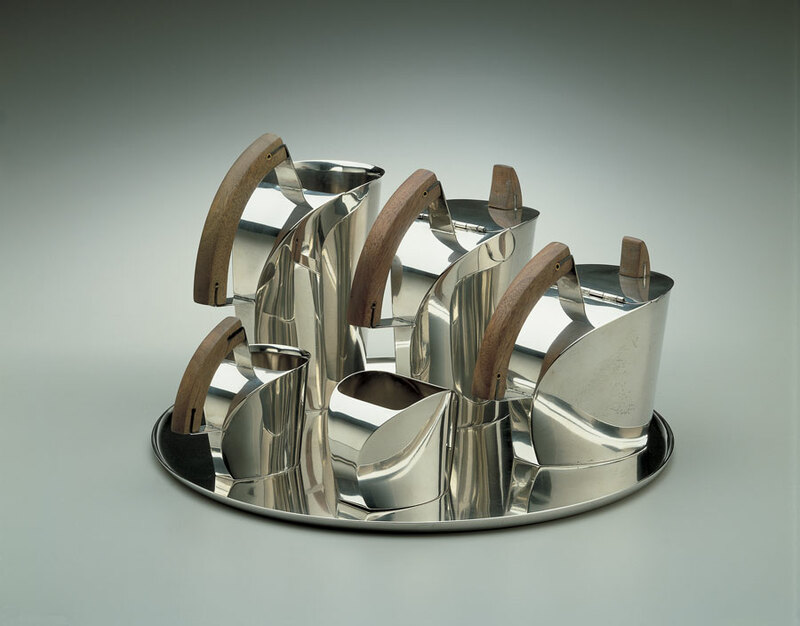 The form of Bertoia’s Coffee and Tea Service suggests the nature of the liquids each object was meant to contain, while the play of the silver’s arcs and curves, extended through the cherrywood handles and knobs, creates an elegant as well as functional artwork. Although completed fairly soon after coming to Cranbrook, the dynamic forms and sweeping surfaces of the Coffee and Tea Service represent Bertoia’s independence from Eliel Saarinen’s highly geometric designs. This service was privately commissioned by a Bloomfield Hills couple and is accompanied in the Art Museum’s collection by a set of maquettes for another coffee and tea service by Bertoia.